Nostoc on a gravel drive. To say we are off to a wet year is an understatement! We were wet going into 2019. As a matter of fact, some cotton and soybeans were never harvested because it was just too wet. However, remembering back on some drought years, I’m not complaining. In 2007 we had very little rain in March and none in April or May, plus there was a major freeze event that year. In 2016 we were dry from late August through December and are still seeing impacts of that event. I just wish I could get my boat out of my shed before all the fish drown. Clay soil and street tires just don’t go together! 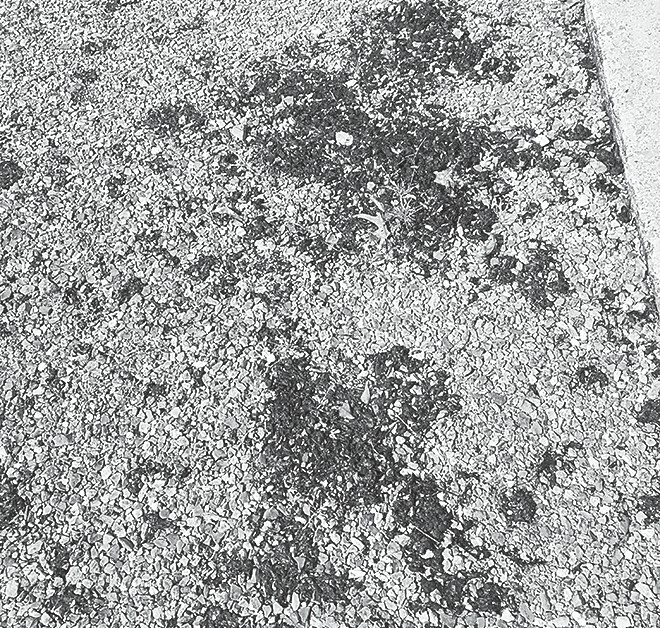 With all the rain you may have noticed a greenish, maybe blackish, slippery, jelly looking stuff on your gravel driveway, concrete drive, or maybe your lawn. When it doesn’t rain, the stuff begins to dry out, shrink, and turn black. Then when it rains, it rehydrates, turns green, or brown to blackish green, and looks a good bit like filamentous algae that are frequently seen floating in ponds. This organism is known as Nostoc. Nostoc species belong to a genus of cyanobacterium formerly classified as blue-green algae. It has many names such as mare’s eggs, witches’ butter, and star jelly. Following a rainy or wet period, it may appear suddenly on lawns, pastures, paved surfaces, roofs or stones. It can be dangerous because it is very slippery when wet and hydrated. Around here I have seen it mostly on gravel driveways. It can adhere to the tires of your vehicle and be spread from place to place; keep that in mind. When found in lawns it is usually an indication of poorly drained soils or wet sites. Fertilizers containing phosphorus will also enhance the growth of Nostoc. So the question becomes, “How do you get rid of it?” It’s not easy. To discourage its growth, improve drainage and eliminate phosphorous fertilizers. Herbicides that contain potassium salts or fatty acids may be used to kill it in lawns. Products such as Bayer Advanced Moss and Algae Killer, Safer Brand Moss and Algae Killer, and Garden Safe Moss and Algae Killer Concentrate may be used. I have a friend that has used baking soda with some success. Always read the label on any products you use. I don’t think you will find a label on baking soda to control Nostoc and I am not recommending it; I’m just relaying the results he has observed. Once it has dried out it may remain dormant, in place, until environmental conditions favor it, which will be an extended period of wet weather. Modification of the environment, such as improving drainage or soil aeration may also assist in controlling Nostoc. Just keep in mind that is has been around for an estimated 3.5 billion years on planet Earth. Nostoc species also possess redeeming properties. They have been used as a food and medical source for centuries. They are being evaluated for antibacterial metabolites, cholesterol regulation, and control of certain cancers. They have the ability to fix nitrogen from the air and contain pigments which allow them to use the sun’s energy for photosynthesis. They contain compounds capable of absorbing ultraviolet light, which allows them to withstand extreme UV radiation. Certain species of this genus are adapted to water and land and are able to withstand extreme temperatures, such as volcanoes or the arctic. It’s no wonder that they have been around for so long. If the weather was a bit warmer and we were a bit further into the year, I would say that you may also be experiencing slime molds on lawns. Slime molds are fungal in nature and usually disappear quickly when the weather turns dry. It also looks like a slimy goo on the lawn when hydrated and turns to a gray or black powder when it dries. I have only seen slime molds on the lawn and not on paved surfaces, but never say never. Right now, I would say if you have a nasty looking jelly-like mass on your drive it’s more than likely Nostoc. Dan Porch is County Extension Coordinator with the Blount County Extension Office. Dan lives in and loves Blount County and is available to answer your questions about conservation, agriculture, natural resources, and gardening. He can be reached at (205) 274-2129 or porchdw@aces.edu.